Snakes are natural predators of birds, therefore a bird that may be looking at your lawn/garden will see the snake and be deterred. How to use – To start you just throw it on the lawn/garden you want to protect. But we know that birds are rather cunning and can ’smell at rat’ as it were. So every day I went out to my car (which was walking past the lawn I was trying to regrow) I would move the snake a bit. Not much ongoing maintenance but it is there. 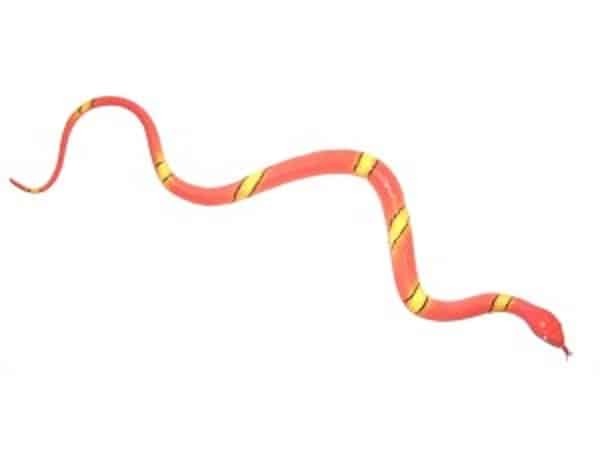 When I bought the plastic snake I asked the lady at the two dollar shop, if she had anything that would keep the birds off my lawn. That’s when I was pointed towards the shelf of plastic snakes. For a total cost of $2, I thought I’d give it a try. There was a whole bunch of different colours of snakes; I picked a bright orange one so I knew the birds were going to see it. When I got home I took it out of the bag and just put it straight on the patch of lawn that I was seeding and walked inside. I did make the effort to conceal some of the snake in some existing patches of lawn, to give the snake some kind of realistic look. I remember when I got home proudly after my next day’s work, looking at the patch of lawn. My wife was walking up the path and towards the front door where I was. “Look no more birds!” I exclaimed, with a grin on my face. She look back at me and it was clear she didn’t share the same enthusiasm, we both walked inside. Over the next few days and slowly at first, the birds kept coming back. The snake did keep the birds away for a few days (from what I saw) but eventually they grew wise to my plan. They obviously knew the snake wasn’t real because they were snacking on my lawn seed rather close. Because the birds were so close to the snake I decided to start moving it every few days. I didn’t set an alarm or go outside just to move the snake, every time I walked past the snake (to leave the house or go to the car) I moved it a little bit. This was a last ditch attempt to fool the birds. It didn’t seem to work, the birds didn’t care where the snake was. They were happy to eat lunch within 1 metre of the snake, which had been moved earlier that day. Conclusion – The patch didn’t grow back completely; there were still broad sections of dirt 10 days after first sowing. Although some blades of grass did end up growing, the majority were taken by the birds. 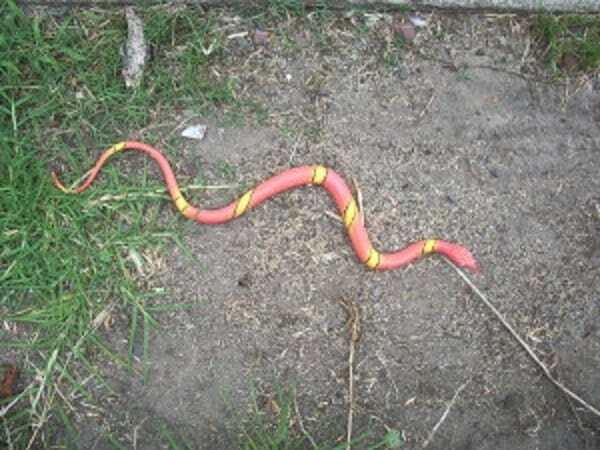 The plastic snake is best for a smaller area where it is moved regularly, as it doesn’t take long for birds to take to an area a few metres away from a snake it has seen. The snake suffers from a lack of scaring methods, as it is pretty one dimensional. It also doesn’t move on its own, when the birds are around. If it moved, it would spook the birds more and be more effective.